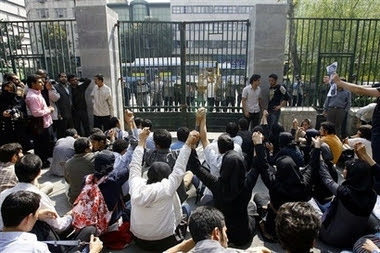 Iranian Students Protest "Dictator" Ahmadinejad at University! 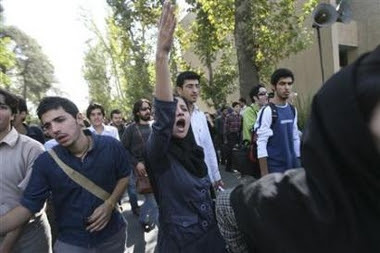 Iran Press News Persian posted the video of the protesting youth at Tehran University today. Unlike the Columbia students, the university students in Tehran were not as polite with the president of the regime. 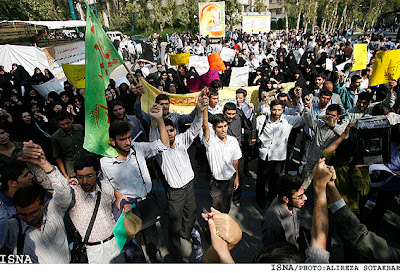 Iranian Students at Tehran University lashed out at Ahmadinejad today during a speech! 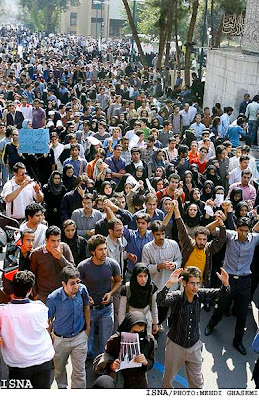 TEHRAN, Iran – An estimated 100 students staged a rare demonstration Monday against Iranian President Mahmoud Ahmadinejad, calling him a “dictator” and scuffling with hardline students at Tehran University. Ahmadinejad, who was giving a speech to a select group at the university to mark the beginning of the academic year, ignored the chants of “death to the dictator” and continued with his speech on the merits of science and the pitfalls of Western-style democracy, witnesses said. The protesters scuffled with hardline students who were chanting “thank you president” while police looked on from outside the university gates. 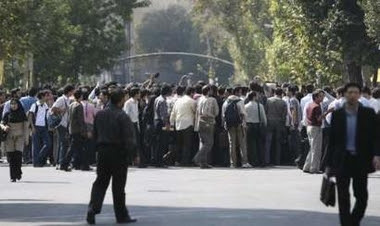 The protesters dispersed after the car carrying Ahmadinejad left the campus. 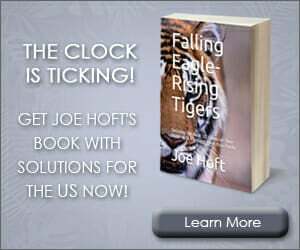 Students were once the main power base of Iran’s reform movement but have faced intense pressure in recent years from Ahmadinejad’s hardline government, making anti-government protests rare. 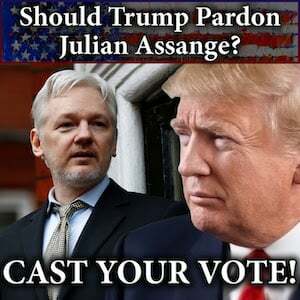 The president faced a similar outburst during a speech last December when students at Amir Kabir Technical University called Ahmadinejad a dictator and set fire to his picture. Hoping to avoid a similar disturbance Monday, organizers imposed tight security measures, checking the identity papers of all students entering the university and allowing only selected students into the hall. But the protesters were somehow able to gain entrance.